With the Christmas present-buying season in full swing, newspapers and magazines are full of lists compiled by the great and the good announcing their favourite reads of the year. Insignificant and mischievous I may be, but I thought I would join them and tell you about a few of the books that I’ve enjoyed this year. First, I must admit that most of these books are not from this year’s bestseller lists. I pick up books from all sorts of places. Some of these books were published many years ago. Some have been recommended by family and friends. Some were found in charity and second hand bookshops, and just a couple of these favourites are from recent bestseller lists. 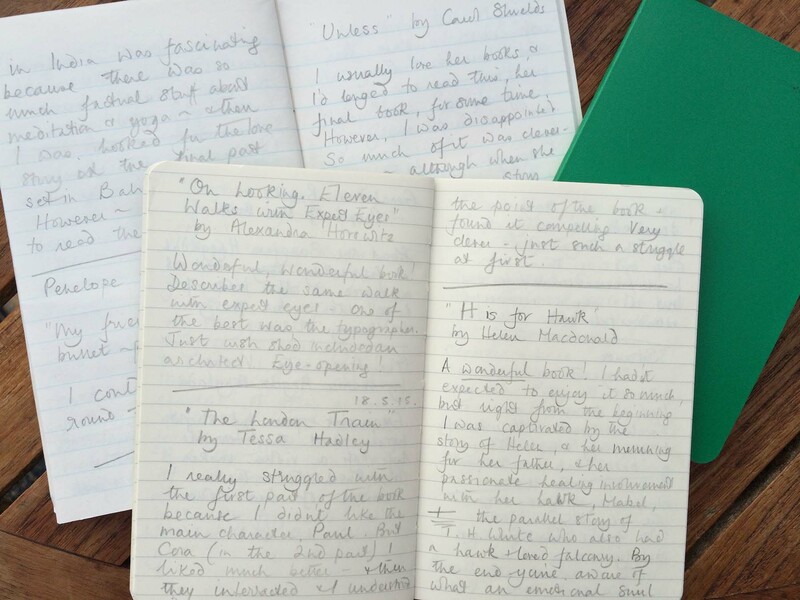 To help me, I’ve dug out the small notebooks in which I jot down the titles and authors of books I have read – and a few words about the book. This is not as impressive as it sounds. I actually do it because it helps me remember what I’ve read! Alas – all too often these days I find that with favourite authors, I cannot remember which of their titles I have actually read. It’s a sad day when you return home all excited with another novel by a great author only to find you’ve read it before! My first book, On Looking. 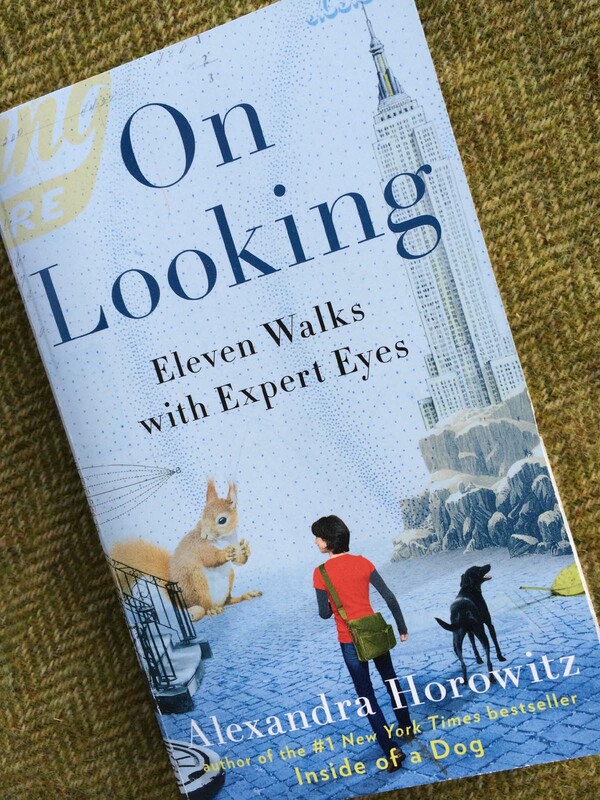 Eleven Walks with Expert Eyes (by Alexandra Horowitz) was a recommendation from Rebecca of Needle and Spindle, (which was in turn a recommendation from Stephanie of My Vintage Inspiration.) As the title says, Horowitz embarks on eleven familiar walks with “experts” to try to see her environment with fresh eyes – and the so-called “experts” include her 19-month year old son, Ogden, and her dog, Pumpernickel. How these two lead her to re-interpret her environment is just as interesting as the recognised experts (who include an illustrator, an animal researcher, a medical doctor, a sound engineer – just to give you some idea of the variety of disciplines she consults for this research). I’m a sucker, anyhow, for walking round big cities with my head in the air, studying the roofs and upper elevations of buildings. There is so much of interest in just the ordinary of places, and far too often we (like France Cornford’s fat white woman) walk round “missing so much and so much”. Of all the experts, I learned most from the geologist and the typographer – probably because these disciplines are most alien to me. Our cities and towns are full of stones and writing – how wonderful to see these familiar materials in a new light! If you, like me, love to go slow on your walks, looking round and questioning the minutiae of life, this book could be for you. 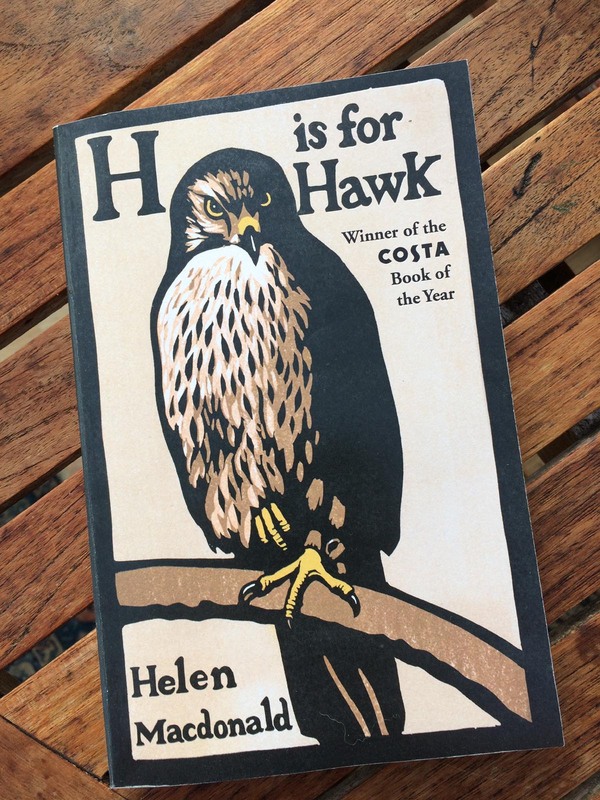 H is for Hawk (by Helen Macdonald) is a prize-winning book (the 2014 Costa Book of the Year and the 2014 Samuel Johnson Prize for Non-Fiction). Initially, I wasn’t really drawn to it – I’m not terribly interested in raptors, and certainly not falconry. But my husband had it on his Christmas list last year. As he’d raved about it, and it was sitting about the house, I thought I’d give it a try. Wow! It was magical, enveloping, captivating. It has several strands, and it is the intermingling of these different stories (coupled with her honesty) that, I think, makes the book work so well. Firstly, it’s a lament for her beloved father. In one of the early chapters, we hear how the family got the unexpected news of his death. In many ways, the underlying current in the whole book is her struggle to cope with life again after this family tragedy. Secondly, there’s the story of Mabel, the goshawk she adopts and trains. The relationship between her (the falconer) and the bird is as intense and driven as the most passionate love story. Who knew? I had no idea it demanded such emotional commitment to train a young goshawk! Lastly, there’s the story of T.H.White (most commonly known as the author of The Once and Future King) who was also nuts about goshawks, and sadly – indeed tragically – did everything wrong in the training of his particular goshawk. Why does it all work so well together? Perhaps because there’s so much hurt, so much pain, in each story? I don’t know. But it’s an absolute winner. 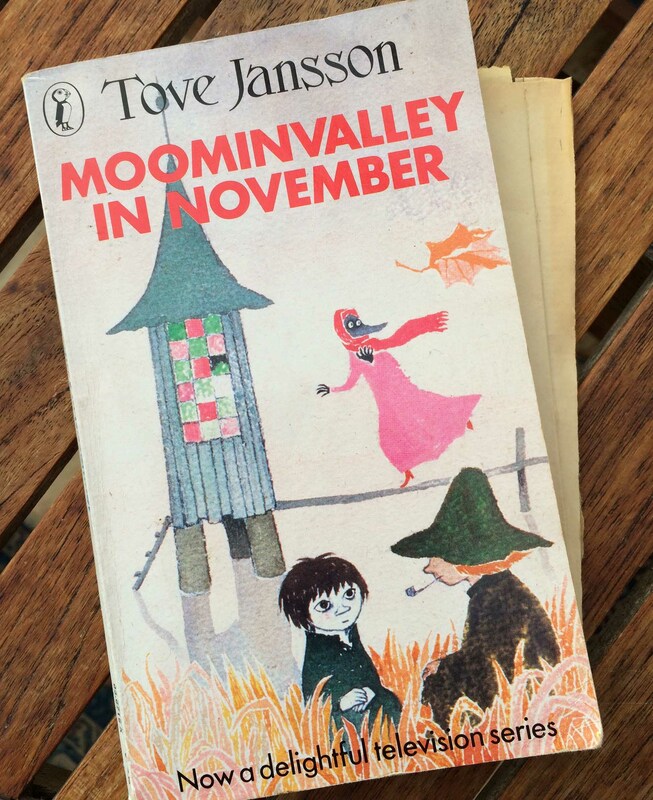 In November, I read Tove Jansson’s Moominvalley in November – of course! You may be surprised to find a children’s book here, but I read a lot of children’s books – often they’re as interesting and challenging as adult fiction. Moominvalley in November isn’t challenging – it’s melancholy and reflective and perceptive. Various Moomin friends in various places find themselves unsettled by the season and decide to check out the comforting Moomins in their Moominvalley home – but they aren’t there! We don’t learn why the Moomin family isn’t at home – perhaps they’re as unsettled as the other characters? Instead, the novel concentrates on these friends, their interactions, and the way they try to make the Moomin home work in a “Moomin” way. Jansson is as skilled at drawing portraits of her characters with words as in pen and ink sketches. Of them all, I’m most fascinated by Fillyjonk because (reluctantly) I admit to seeing a lot of myself in her. She wants to be to the others as Moominmama is: she wants to make nice food, clean the house, be motherly. Of course, she fails to be Moominmama – and the others don’t like her attempts to be Moominmama-ish. But she does find a way to be happy with being Fillyjonk. (It’s Fillyjonk wearing those fab pink clothes on the cover, and supervising the picnic in the sketch.) Perhaps you too know and love Donnie Monro’s song , The Weaver of Grass? It’s a gloriously jubilant song with the repeated refrain, The Weaver of Grass is coming home! 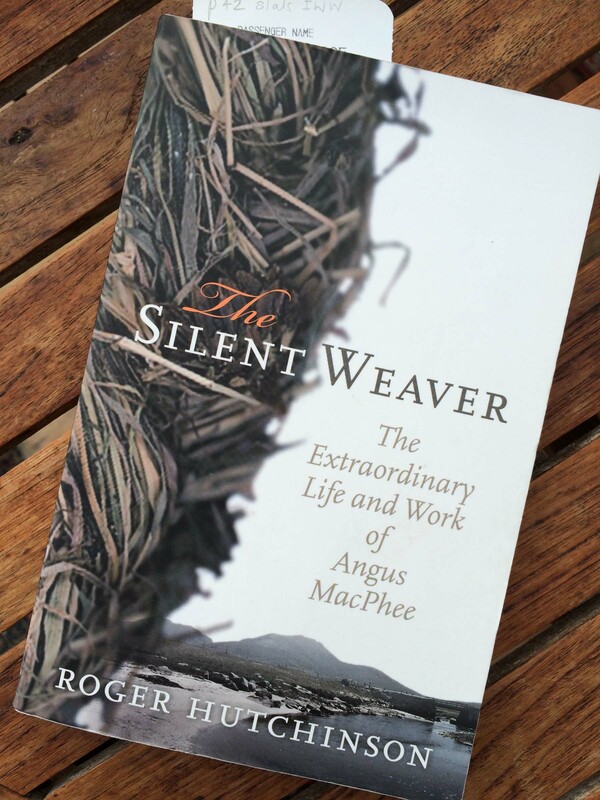 I never took much interest in the other words (probably because I was always concentrating on my knitting), but this year, we happened upon Roger Hutchinson’s The Silent Weaver. The Extraordinary Life and Work of Angus MacPhee in a charity shop (sorry, Roger) so I learned a lot more about this very fascinating man. Angus MacPhee was born in 1916 on the island of South Uist, part of the Outer Hebrides, and spent his youth there as an unremarkable young man with his humble crofting family. In 1934, he joined the Lovat Scouts Territorial Army Unit so, when war broke out in September 1939, he was called upon with his fellow Lovat Scouts to garrison the Faroe Islands. But on these islands, he slid into catatonia – simply stopped speaking and registering speech. He was shipped back home to South Uist. Sadly he didn’t recover at home, so he was taken to the Scottish mainland, diagnosed with schizophrenia and remained in asylums for more than 50 years. In itself that story is intriguing – but what makes it extra fascinating is the grass weavings he made in hospital. He is known now by the trendy label of Scottish Outsider Artist. As photos of his work are under copyright, I’ll refer you to an internet search to see what sort of things he was making. You will rejoice – with Donnie Monro – to hear that in the 1990s, because of changes in the treatment of patients with mental health problems, Angus was at long last sent back to South Uist. It’s this return that Donnie Monro celebrates in his famous song. I’m in two minds about this Outsider Artist status. What I love about the story, is that Angus MacPhee was by all accounts a very gentle (if silent) man who pottered on through his life, making the best of it, and indeed, just making, of whatever materials he could find, all sorts of things. A Maker indeed. And, of course, it came right in the end. He went home. 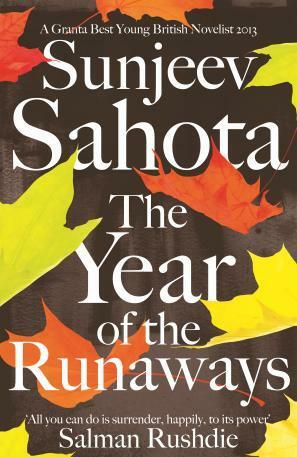 When, earlier this year I was planning a trip to London and wanted a novel on my Kindle, my eye alighted on Sunjeev Sahota’s The Year of the Runaways on the 2015 Booker shortlist. The news was full of terrible stories of migrants, struggling against the odds to leave war-torn and poverty-stricken lives in their native countries so I was interested in a novel that purported to be about migrants. How glad I am that I did! It’s the story of three Indian men, Tochi, Randeep and Avtar, and a British-born Indian woman, Narindar. We learn why they are driven to leave their lives in India (all with tragic overtones) and what happened to them as they struggled to build new lives in Sheffield. It’s shocking – an eye-opener, without doubt. Tochi is a chamar (an untouchable) and the personal tragedy that spurs his move to the UK is truly awful. Avtar is driven to sell a kidney to fund his travels. And Randeep – poor, foolish Randeep, is swept along by his mother’s aspirations and one stupid moment’s thoughtless action. Their life in England is miserable – absolutely remorselessly miserable. Intertwined with this is the story of the devout Sikh woman, Narindar, who has married Randeep in a mercenary contract to allow him to remain in the UK. She has her own complicated reasons for this action. I learned a lot reading this book. It did indeed open my eyes. But it wasn’t just a lesson – I was completely drawn in by the magic of Sahota’s storytelling powers. The story takes you to places you would never have imagined – and amid the misery and anguish, there is grace and love and humanity. Not really at all what I was expecting. But just brilliant. The cover of my Kindle: an old knitted experiment with pattern and colour. It’s been a struggle to restrict myself to just five books. There are other wonderful books that I’ve read this year which I’d love to tell you about. Perhaps you’ve got some recommendations for me? I’d love to hear what you’ve enjoyed reading this year: please tell! This book is an old friend and stays on my bedside table. A set of essays about the experiences of a woman who goes to live and work as a shepherd in Wyoming. Wonderful descriptions of the landscape, the weather, the problems of tending sheep in such lonely wild terrain – but most of all it is the descriptions of her encounters with the other farmers in the area that are so memorable, all told in beautiful prose but with an almost Camus-like air of detachment. Another friend’s transmission froze while he was in a bar. The only gear that worked was reverse so he drove the eight miles home backward through two towns and up the hill past the hospital, waving at astonished onlookers all the way. When his wife acused him of drunkenness he said, ‘I just got tired of looking at things in the same old way.’ I have always loved the novels of Georges Simenon ever since I was a student, particularly those which feature Inspector Maigret. I used to collect the old green Penguin Crime editions but starting last year Penguin are issuing all of the Maigret novels in new translations at the rate of one a month – so it will take 75 months! I have currently got up to volume 18. They are all fairly short, about 120 pages or so, but so full of atmosphere, insight and incident. And what a creation is Maigret – nothing like the angst-ridden detectives we seem to prefer these days. No, he is just full of humanity; and he often comes to sympathise with the criminal – If I was in this situation I think I would have done the same. As Simenon said, My motto to the extent that I have one, has been noted often enough, and I’ve always conformed to it. It’s the one I’ve given to old Maigret, who resembles me in certain points . . . ‘understand and judge not’. Here we meet R Stornoway who is a drink-addled misfit living on the Isle of Lewis in the Outer Hebrides. How he wants to leave the island for a better life, but that proves impossible for him and his friends, all 30-somethings living off benefits. Highly original, full of verbal invention around the Gaelic language, hilarious, poignant, but ultimately heartbreaking. Fionnsbagh: the way some albums from your teenage music collection grow bland or raucous over the years so Hey! Your parents were right. And if they were right about that, they might have been right about other things too. Distressing. I’ve always loved the novels of Balzac, with their marvellous panorama of characters across the whole spectrum of society. I reread Old Goriot about 3 years ago – the tale of a father, miserly but doting on his daughter, who sacrifices all his money to promote her socially – only for her to disdain his shabby penurious existence. This year I read A Harlot high and Low on my Kindle. (There is a vast range of literature from 50 or more years ago available on line for free from the University of Adelaide – in the last year or so I have downloaded books by George Orwell, Leo Tolstoy, Thomas Hardy et al.) This book is all about high society during the 2nd French Republic in the 1840s. A vivid cast of characters all jostling for social status and, more importantly, the money they need to sustain their position in Parisian society. Boy! is the novel obsessed with money – loans, stock market investments, annuities. The plot is fairly dense, (at times I think I missed some of the details) but the writing and insights shown are superb. The man was a genius. Paris, you see, is like a forest in the New World where a score of savage tribes, the Illinois, the Hurons, struggle for existence: each group lives on what it can get by hunting throughout society. You are a hunter of millions; to capture them employ snares, limed twigs, decoys. There are many ways of hunting. Some hunt heiresses, others catch their prey by shady financial transactions; some fish for souls, others sell their clients bound hand and foot. The man who comes back with his game-bag well lined is welcomed, feted, received into good society. Let us be just to this hospitable place, here you have to do with the most accommodating city in the world. If the proud aristocracies of all the capitals of Europe refuse to give a blackguard millionaire admittance to their ranks, Paris holds out her arms to him, runs to his parties, eats is dinners and clinks glasses with his infamy. I’ve saved the best to last! In retirement I have been reading all those novels that I somehow have felt that I ought to have read but never got around to, particularly those by American authors. Novels like On the Road, Catcher in the Rye and The Grapes of Wrath amongst others. Of all these the one that stands out by a mile is The Grapes of Wrath. Written in 1939 it is set against the background of the Dust Bowl in Oklahoma which forced so many families to travel to California along Route 66 – believed to be a promised land. The story tells of the Joad family and of their false hopes, thwarted desires and broken dreams. And yet out of all of this suffering Steinbeck weaves a drama that is at the same time majestic but also intensely human. It has a great sense of moral vision, of the basic goodness of the common people, a tribute to many of the values we seem to be losing from our Western society. The second son of the family, Tom Joad, an archetypal anti-hero, eventually overcomes his criminal past to take on responsibility for the family. John Ford’s film adaptation of the novel inspired Woody Guthrie to write the song ‘The Ballad of Tom Joad’. In its turn this inspired Bruce Springsteen to write the song ‘The Ghost of Tom Joad’, which was also the name of his 11th studio album of the same name. Springsteen clearly identified himself with the social activism of the 1930s and tried to give voice to the unseen and unheard. Throughout the novel the Joad family, dispossessed from their land and with no material resources, keep their dignity; and what little they have they share with those in the same situation. And the final pages of the book reduced me to tears when the daughter whose infant child had just died shortly after being born gives comfort to a starving stranger. Thank you for this amazing book list! I absolutely love your idea of keeping a book diary. It reminded me of my university years when you have to read 100 books in three months and remember all of them 🙂 I’ve read only one from this list – “The Grapes of Wrath”, I was absolutely enchanted with it! I am so glad you enjoyed it, Alina! I am just in awe of somebody who can read 100 books in 3 months – let alone remember them. Wow – that was some university course. I think the Grapes of Wrath is wonderful – but almost unbearable. I don’t think I could bring myself to read it again but perhaps that’s not necessary because it is such a magnificent story that it stays with you. Crikey! Another cracker of a post! Where to begin? Firstly, so glad you enjoyed the 11 walks book. It is such a gift to glimpse the world through the eyes of a stranger for a little while. Secondly, melancholy is a perfect description of Tove Jansen’s Moomin books…all of them. I never noticed as a child, I was just captivated by the narrative. 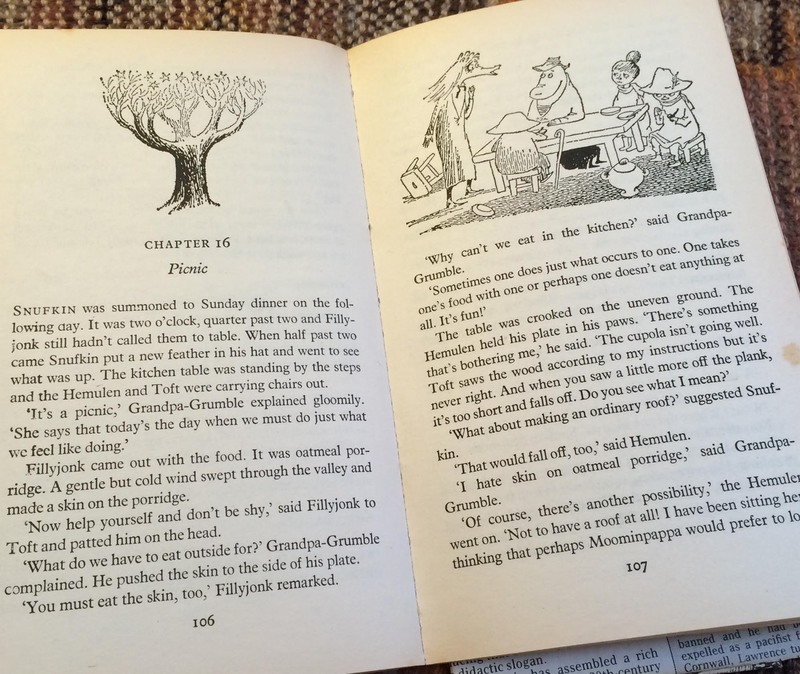 But every character is a little wistful, a little flawed…the restlessness of Snufkin has sliver of hardness to it, the nostalgia of Moominpapa is a little bit sad, and then of course the naked grief and isolation of the Groke. What curious tales they are. Sometimes I feel that if i read them long enough, I will find some exquisite existential wisdom in them, I always feel on the edge of understanding something hinted at but never quite get there. Finally, Grapes of Wrath!!!! Oh what a mighty mighty book. I read it ten years ago for the same reasons as you, I had never quite got around to it before. (Still haven’t read Catcher in the Rye). Steinbeck is an absolute genius, the Billy Bragg of literature, his words are like razors cutting away prejudice and exposing the very best and the very worst of humanity but with such infinite compassion. I thought about the scene you mentioned at the end a lot when my babies were little. Steinbeck infuses that act with both utter loss and tender kindness. How could it not sear our memories. Also the blog is looking just lovely, i am not sure if it is because I am on my laptop and am seeing the full version rather than the mobile one but it looks gorgeous. Thanks for all these recommendations, I have noted a lot of them. I love John Steinbeck so hurrah for the last one. Going to California and doing my own Steinbeck tour was one of my favourite holidays ever. Sounds like the Steinbeck is the all time winner! – how absolutely wonderful to do a Steinbeck tour – you must have read a lot of his books then? I hope you enjoy our recommendations – do let me know what you think. Have now re-read your post (away from home – easier to find a moment) and as you know have enjoyed it and now have the Hawk book lined up and waiting (isn’t that the best feeling, a pile of good books as yet un-read?). Curious that The Goldfinch appears in the picture but not your list – have you read it? I found myself utterly riveted and it comes back to me at odd moments. I should probably do my own list – what would I choose? indeed it must be difficult to whittle it down. Back to your list. I’m ashamed to say that Steinbeck is one of those I’ve never got around to but feel motivated by reading about it….. Also drawn to the immigrants book and will keep a lookout. The only one on your list I’ve read is Ways of Looking, thanks to you! And did very much enjoy it. I thought it would stay with me but sorry to say it hasn’t – bear of little brain I must be. Thanks for another excellent and informative post! Glad you’ve enjoyed post, Polly, and found inspiration and interest. Yes, I have read The Goldfinch, and loved it – but it was earlier in the year and sort of got superseded by later reads. Incredibly difficult to do just to what one has read in a year – Perhaps next year I will do it better. The Steinbeck gets recommendations all round – do read it! But it’s heartbreaking. Previous Previous post: Yet more GiveWraps!